What’s up all my dudes and dudettes! We back at it again with the super dank blogs! So today as I was perusing the interwebs I came across a cool Kickstarter. The projects name is Kai and it’s a personal assistant that functions like Google Glass. The nice thing about this is that you can wear this almost all the time since it goes on to the back of your glasses! One thing though is that it doesn’t have the AR technology that the Google Glass offered. I don’t really mind that though, since it is kind of gimmicky. The voice control for the Kai is really intuitive, your able to set dates, text people, and many other things with the device. One of the things that I really like about the Kai is that the speaker in it is a bone structure speaker so you can hear it, but other people can’t. That type of privacy is something that I can really appreciate in a device. 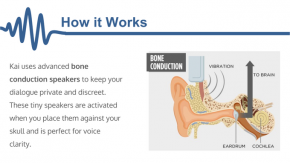 The device uses a software called Houndify to handle all the voice control and text to speech. While the creator said he could have used other software for this, he decided on Houndify because of the extra options it offered. The main thing the creator wants to achieve with this device is to keep people from looking at their phones and look at the world around them. He wants people to have the ease of access of their phone while interacting with people. I really think this is a good idea and would really help people with connections. Hopefully we see this project get past its Kickstarter and go into the regular market. Studying Computer Science at UAT. Originally from Milwaukee, Wisconsin.